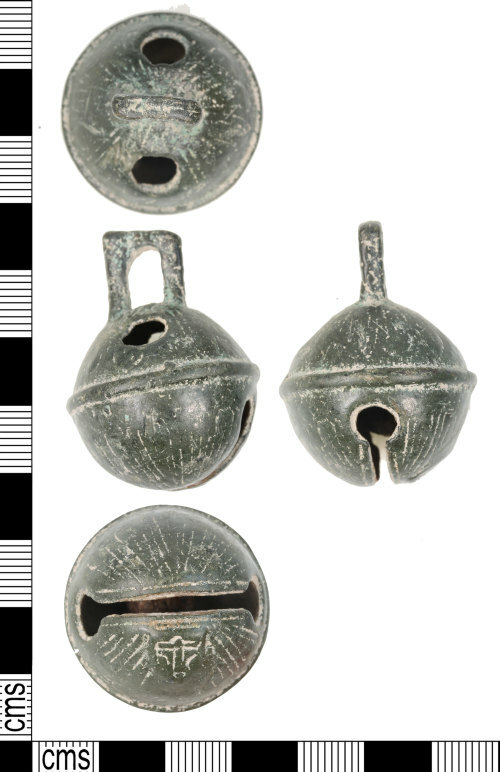 A complete worn cast copper-alloy crotal bell of Post Medieval date c.AD 1500-1700. The bell comprises two hemispherical domes divided horizontally by a circumferential ridge. The upper hemisphere has two circular sound holes. A square integral cast suspension loop projects from the apex of the upper dome, with bevelled hole and bevelled sides. The top of the suspension loop is slightly miss-shapen. The lower hemisphere has a long, thin sound slit with circular holes at the ends. The inner iron ball or clapper is in situ. There is decoraton formed of incised lines unevenly spaced and cut on both hemispheres. On the base of one side of the bell is an incised letter T, a makers mark. Dimensions: Height 37.89mm, width 27.89mm (diameter of the bell's body) and 22.93g in weight.